Garage doors are large machines that are comprised out of hundreds of different moving parts, and therefore can suffer a number of different issues of varying degrees. Our team of extremely devoted and skilled repair specialists can help you with every related problem, from the simple worn-out motor gear to a broken spring replacement. When first getting your garage door set in, it's important to employ a professional technician who can make sure every single piece of this elaborate system is set up correctly, and that every single part functions perfectly once the installation is completed. The best way to ensure your garage door continues to function properly for as long as the gods of complex machinery will allow it is to have it undergo some routine maintenance. This can make sure that any little offset of balance or worn-out piece doesn't become a big problem later on. Our expert service technicians will give your entire system a onceover; we'll lubricate the many different pieces that can benefit from it, and we'll test all the safety and security features to make sure they're all in perfect shape. Even the most highly advanced systems can suffer from an unexpected malfunction. Sometimes it's merely a rusty hinge that's causing the issue, other times it can be a worn-out spring, which can make the door panels get off balance and potentially collapse. Needless to say, such a scenario will be extremely dangerous for any nearby person or property. 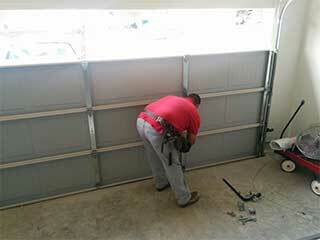 That's what our experienced team at Garage Door Repair Irvine is here for. We'll adjust the spring tension of your door, replace every part that proves to have gotten too damaged to function properly, and make sure your system stays safe to use for as long as it can. Call us today.